Available through TTI Europe, are Murata’s IR series DC-DC converters, created especially for use in industrial and railway applications. Models offered include the IRQ100 series 100W single o/p regulated outputs in an industry-standard quarter brick, and IRH150 series 150W single o/p, and IRS50 series 50W sixteenth brick package. The devices deliver fully regulated DC outputs of 5, 12, or 24VDC, from a 3:1 wide input range of 57.6 up to 160VDC. 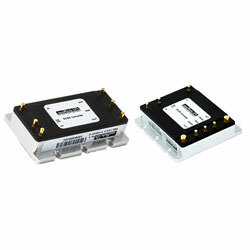 Highly shock and vibration tolerant, the DC-DC converters meet the requirements of EN50155 for nominal VIN voltages of 96VDC and 110VDC including brownout and transient conditions and provide improved EMI and outstanding thermal performance. These products are fully encased package and satisfy the requirements of EN60068 Damp Heat and Dry Heat, and benefit from a maximum baseplate operating temperature of 100C, full load. Also available is the IRS range, 50W single o/p in an industry-standard sixteenth package, with multiple baseplate options, with I/P V range options of 9V-36V or 18V-75VDC.